Asian markets traded higher Monday afternoon as investors digested fresh official data of of China that showed the world’s second-largest economy grew 6.6 percent in 2018 — the slowest pace since 1990. That number matched analysts’ expectations and was lower than a revised 6.8 percent growth in 2017. Fourth quarter GDP growth was 6.4 percent, which was also in line with expectations. “I think what we’re seeing actually in the fourth quarter is that while the economy is decelerating, we actually still have some of the supports,” Helen Zhu, head of China equities at Blackrock, told CNBC’s “Street Signs” on Monday. Chinese President Xi Jinping and U.S. President Donald Trump agreed to a 90-day pause in tariff escalation at the G-20 summit in Argentina last December. While Beijing’s official GDP figures are seen as one of the crucial indicators of China’s economic health, many outside experts have expressed skepticism about the veracity of the numbers. Raymond Yeung, chief economist for Greater China at the Australia and New Zealand Banking Group, wrote in a note that China’s GDP numbers are “not an accurate gauge” of its economic growth. Still, he pointed out, the gap between the actual figures and the official targets usually shapes the government’s policy stance. The mainland Chinese markets, closely watched as a result of the ongoing U.S.-China trade fight, saw gains on the back of the data release. The Shanghai composite rose almost 0.7 percent while the Shenzhen component and Shenzhen composite both advanced nearly 0.8 percent. 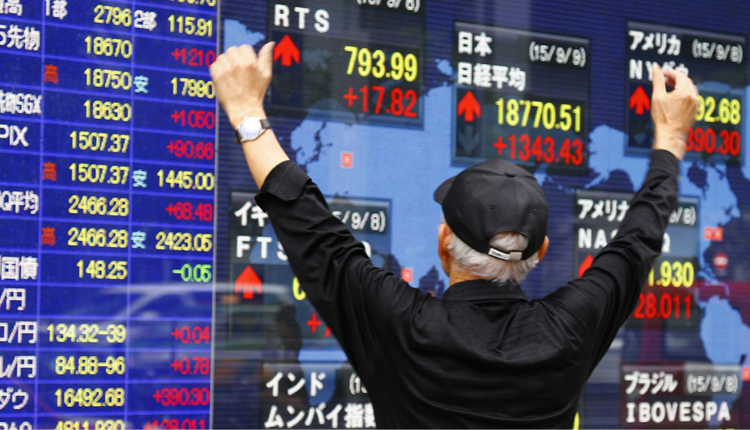 Elsewhere in Asia, Japan’s Nikkei 225 gained 0.31 percent in afternoon trade while the Topix index rose 0.65 percent. Shares of automaker Nissan advanced 0.5 percent after details of former CEO Carlos Ghosn’s renewed bail request emerged. In South Korea, however, the Kospi saw a decline of about 0.16 percent, while Australia’s benchmark ASX 200 rose more than 0.3 percent, with most sectors seeing gains. Australian oil stocks rose as the energy subindex advanced 0.72 percent. Crude oil prices gained on Friday following news that China put forward a plan to eliminate its trade surplus with the United States. Those gains continued into the Asian trading session on Monday, with the international benchmark Brent crude futures advancing 0.4 percent to $62.95 per barrel. U.S. crude futures also gained 0.45 percent to $54.04 per barrel. The U.S. dollar index, which tracks the greenback against a basket of its peers, changed hands at 96.312 after touching an earlier high of 96.374. The Japanese yen, widely seen as a safe-haven currency, traded at 109.60 after seeing highs around the 108 handle in the previous week. The Australian dollar was at $0.7165 after touching an earlier high of $0.7185.